Roller chain couplings are extremely simple but provide a compact and flexible coupling that is suitable for an extremely wide range of applications. Because of the design, the torque is distributed throughout the roller chain and sprocket teeth so there is an even amount of torque distributed throughout the coupler when in motion. Another good thing about a roller chain coupling is that the sprockets and chain produce a slight clearance, which means that absolute shaft alignment is not requited for the coupling to function, however it is highly recommended to have the shafts completely aligned, if possible. One of the components that go into a roller chain coupling is the chain itself. The roller chains we supply are manufactured using components that have been heat-treated, shot peened, and hardened for maximum strength and durability. Typically, a coupling chain is a double-row roller chain that is ANSI size #40 - #120, then supplied as a certain pitch length based upon how large of a coupling you need. The chart below shows the standard stock sizes of coupling chains, but additional sizes are available upon request. NOTE: Our coupling chains are premium quality and conform to ANSI B29.1 standards. Each coupling chain assembly will include one master link. Another major component is the coupling sprockets. Our coupling chain sprockets are manufactured with high quality steel. The teeth are then heat treated and hardened, then the sprocket is black oxide finished for corrosion resistance. The chart below shows the standard in-stock coupling sprockets. When creating a new coupling it is important to match the correct sprocket and chain. For Example: #4016 coupling chain goes with a 4016 sprocket. If you do not see the sprocket size you need on the chart below, please contact us and we will make it within a few days! NOTE: For additional sprocket sizes please contact us. Lastly, we have the chain coupling cover, also knowns as the housing. The covers we supply are manufactured out of high-quality aluminum, includes seals, and are painted yellow. Not only does having a coupling cover provide a huge safety benefit, but it also keeps lubricant on the chain, and it will make the whole coupling assembly look clean and neat. Below is a chart for the coupling covers that we keep in-stock. NOTE: for additional cover sizes please contact us. Installing a complete roller chain coupling is a simple and easy task. Refer to the instructions below for the details on how to install. Place the oil seals supplied with the coupling cover onto the sprocket halves. Adjust the angular misalignment ("α" symbol) so that the width of the tooth surface (T) is the same around the circumference of the sprockets, the allowable angular misalignment is 1°. Next you will place a straight edge at the bottom of the corresponding teeth of the two sprockets and adjust so that the offset misalignment is minimized. The allowable offset misalignment (ε) is 2% of the chain pitch. However, when the sprocket speed is 1/3 or more of the maximum speed the allowable angular and offset misalignments are 0.5° and 1% of the chain pitch. Measure the distance between the sprocket faces (C) and firmly fasten the sprocket halves to the shafts. 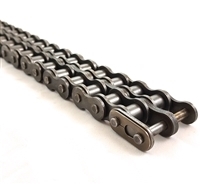 Lubricate the coupling chain with chain lube which we also can supply, then wrap wrap the chain around both sprockets and fix with connecting pin. When it comes to lubrication for the chain you can apply chain lube regularly or install a coupling cover filled with grease/ lube and change every 1,000 - 2,000 hours depending on the application and chain lube used. To find out the best lubrication to use and re-lube schedule contact our customer support team. Fasten the coupling cover firmly and do not forget to use the supplied seals. 1. During high speed operations or conditions of large vibration, use locking cement when fastening bolts/ screws. 2. Install a coupling cover when there is a risk of chain breakage or any safety hazard factors. 3. Ambient temperature range is 14° to 140° Fahrenheit. If you are using a roller chain coupler outside of this range please contact our customer support team to consult with for solutions.